"Returning Players and Newbies Try to Not Become...Extinct?" 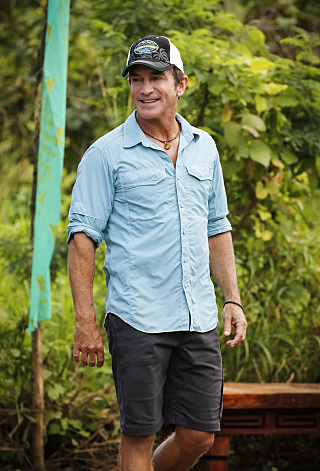 “Survivor is unpredictable and that’s why it’s so great and that’s why you are here,” Survivor host Jeff Probst warned the contestants at the beginning of season 38, the latest installment of the constantly changing show. 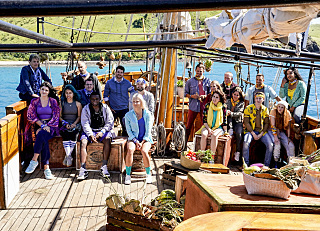 It doesn’t take him long (about a minute into the show’s running time, in fact) to reveal one of the (very obvious) twists to the 14 soon-to-be-abandoned-on-an-island contestants: there are four players coming back to create the typical cast of 18. 18 contestants. 39 days. 1 Survivor. The 14 newbies seem half star-struck, but a few glances among them show they know the danger is real. You don’t keep around veteran players. The Kama tribe seems to be getting along nicely. Victoria, a waitress, waxes poetically about how as an eight year old girl she asked Santa to bring her a Survivor buff (in order to make us all feel old), divorce lawyer Aurora looks dreamy at Joe (almost like the Bradley Cooper-Lady Gaga moment at the Oscars) and then adds humor by saying, “I’m gay and I’m still on Team Joe,” and Etsy shop owner Julie gives us a customary “I’m from New York City so I’ve never seen nature in my life” type speech. (It was something even more boring than that and probably referenced Central Park, but watching city-folk whine about not having seen a ladybug never comes off well). The Manu tribe seems to give most screen time to Rick, a morning news anchor from an “unimportant” media market (and based on how much he over-talks, I fear his attempt to become a major city star may not be in the cards). They also give a lot of screen time to the returning stars Kelley (who promises to be more “human” this time) and David. On another positive note, we also have the inclusion of Wendy, a swap meet vendor and someone with Tourette Syndrome. Sadly, she was pretty insistent on not “going with her tribe’s plan” of voting (later in the show) and became an early target for a possible removal from the tribe. Meanwhile, mother-like Reem created a stir by randomly taking everyone’s clothes to dry on the sand. What possessed her to do this is a bit unclear. Her defense at tribal council of, “If they wanted me not to touch their belongings, they should have told me” seems woefully inadequate. I mean, it kind of sounds like a robber telling a detective, “If the bank didn’t want me to rob it, they should have told me not to take their money away” and the tribe’s response was about as skeptical as the police might be with that bank robber scenario. The Manu tribe went back and until the final verdict came in… 5-4 in favor of kicking off… Reem! 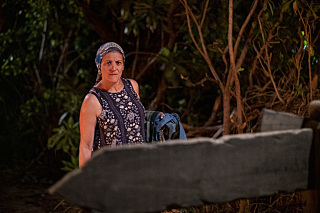 Reem stormed off to scatter more laundry around the island (okay, not really, but you might have got a Tide product placement if you would have tried harder, CBS) to instead discover the Edge of Extinction twist. After a solitary boat ride and some even creepier horror-movie music, she reached an abandoned island, uttered “Oh my God? There’s nothing here. What’s going on? ?” and a few unmentionable things and… the camera cuts out on the season premiere almost like we’re in Scream (but on an island). It’s not like there’s a T-Rex (please let there be a T-Rex), so I’m not sure what type of momentum or suspense they’re building (please let there be a T-Rex!) 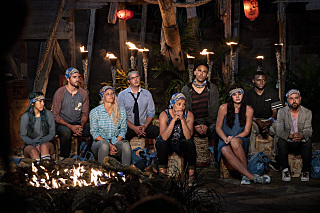 for a pretty much remote, empty island, but since there’s never any real excitement from a first week tribal council vote, I admire the show’s attempt at creating some unique suspense. Opening puzzle seemed more of the same. Would be nice to have more variety.